1. Supportive framework of facing. 1. 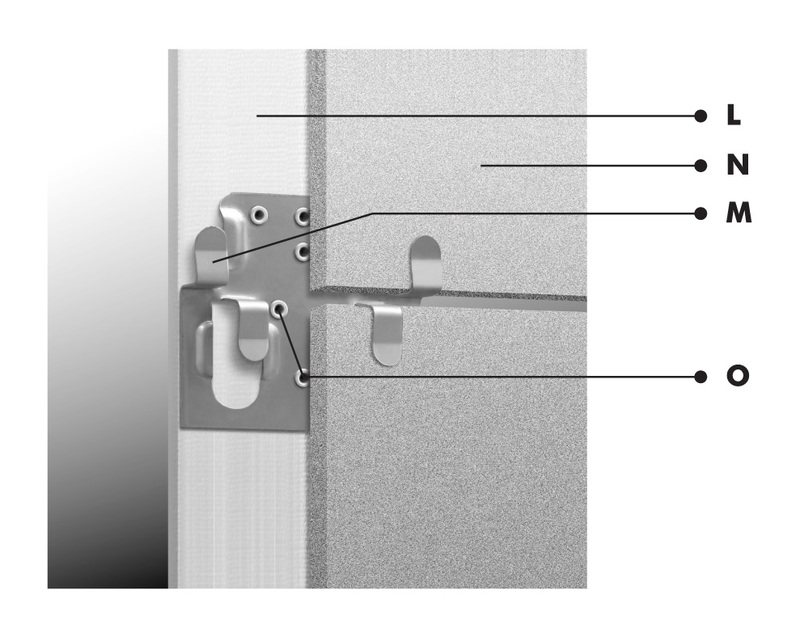 The supporting structure – VESPOL CLIPS – is a system designed to fix the facing with special clips (M). This system is intended for the attachment of slabs made of ceramics, Gres, and fibreglass (N). 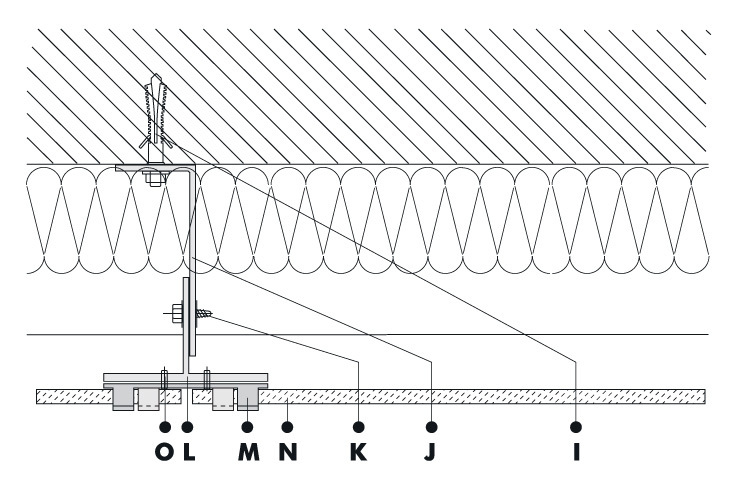 Depending on a framework type, the clips (M) are attached to vertical and horizontal aluminium supporting “T” sections (L). The clips (M) are made of stainless steel and they are al-ways attached to the supporting sections (L) by means of alu-minium rivets (O). 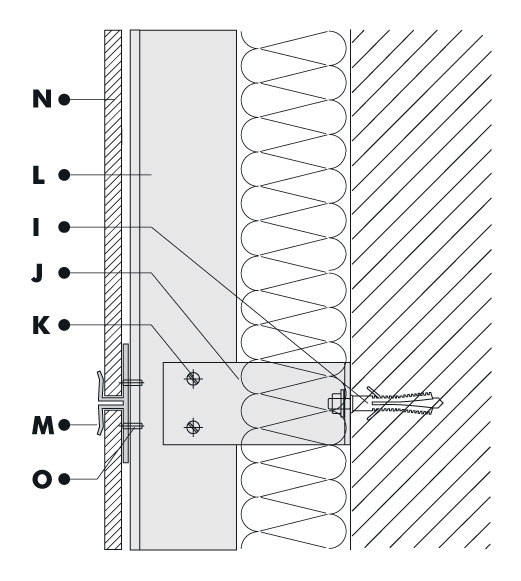 The parts of the supporting structure – the brackets (M) and the bearing “L” section are attached to the foot-wall using beam hangers (J), the dimensions of which are specified by a designer, depending on the sort of foot-wall, insulation thickness, and perhaps, on inequality of the walls (in particular, this holds true for reconstructed objects), on the load of the facing as well as on the design calculation. To join the supporting section (L) and the beam hangers (J), we use at least 2 stainless steel bolts (K) . We attach the beam hangers (J) to the bearing wall using dowels (I). We choose the type of dowels (I) in compliance with the kind of the bearing wall (solid bricks, Porotherm, Ytong, steel-reinforced concrete, steel stru-cture, wooden structure, etc.) and on the design calculation. We accept the type, density, and thickness of thermal insulation on the basis of thermal and engineering analyses. 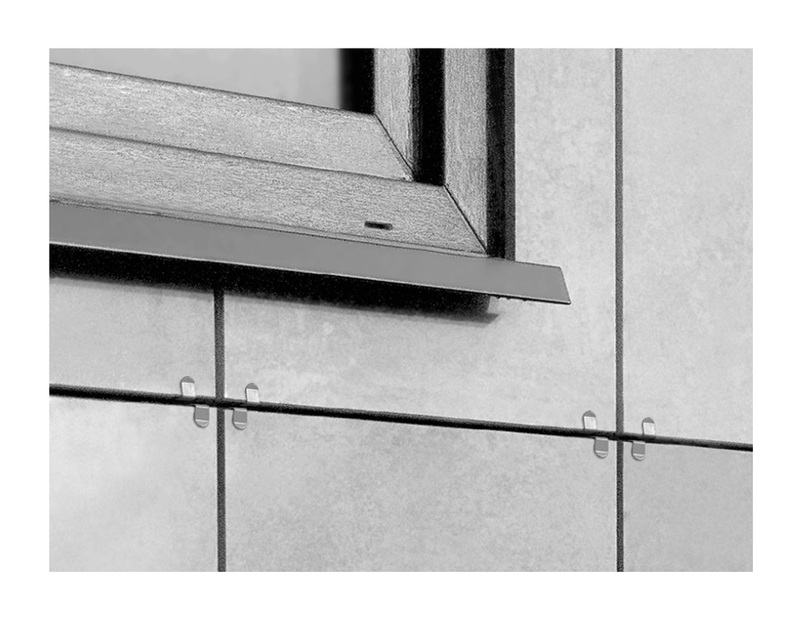 The water-repellent insulation that we use is designed particularly for aerated facades. The insulation slabs are fixed with plastic binding button-like elements. There is a chance to cover up the insulation with a foil that is permeable for water vapour. Available slab sizes in cm: 40/40, 30/60, 50/50, 60/60, 50/100, 60/120, 100/100, 120/180 whereas other sizes are dependent on manufacturers production.